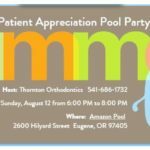 Our annual pool party is almost here! Get excited to swim and play on an obstacle course! Be sure to enter Dr. Thornton’s raffle drawings. There are a TONS of cool prizes! Let us know you're coming by emailing or by responding to the evite or call us!!! Floss, floss, floss. Yes, it’s a pain to floss around your braces, but it’s the best way to prevent gum disease and other oral health problems. Ask Dr. Thornton and our team for floss threaders to make the chore easier. Just a few minutes per day will ensure that you don’t face significant dental health issues when the braces come off. Chew with your back teeth. If you’re used to taking large bites with your front teeth, it might be time to switch your eating habits. Taking a large bite of food with your front teeth can leave your braces vulnerable to damage. Instead, cut large foods into small pieces and use your back teeth to chew. This is especially important with corn on the cob, which should always be cut from the cob. Wear rubber bands. Rubber bands and other orthodontic appliances may seem annoying, but failing to comply with wearing them can increase the length of your treatment by months. Wear them now to avoid problems in the future. Removing braces signals the end of wires and brackets and the start of something beautiful...retainers! 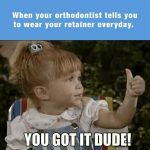 Retainers come in all shapes and sizes and are always customized to a patient's individual needs. Since many patients take the opportunity to customize their appliance with glitter, a design or pictures, the creativity is endless. These small and glamorous appliances serve a important role. All retainers need to be worn consistently, checked regularly and cared for responsibly. After active orthodontic treatment is complete the surrounding bone and soft tissue takes some time to remodel and provide solid structure for the teeth. Until that happens, the orthodontic correction that Dr. Thornton and your braces have accomplished is at risk. Crowding, tooth rotations and spaces returning are all things that need consistent retention to control. This is why Dr. Thornton will see patients regularly for the first year following their braces being removed. He begins the retention phase by asking patients to wear their retainer all day and night, unless eating or brushing. After about 4-6 months, Dr. Thornton will transition patients to wearing their retainers at night only. Caring for retainers is an important responsibility. 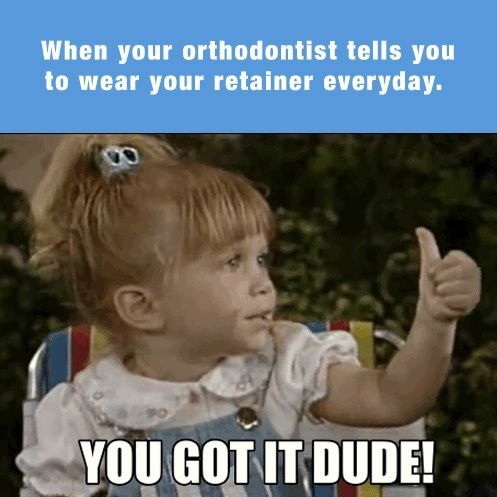 We hate to see families have to replace a retainer unnecessarily because it wasn't cared for properly. Make sure to always put it in the case when it is not being worn. Many retainers have met their end because they ended up on a lunch tray, in a purse or backpack or left on a counter. Also, they make the most untimely dog toys, so watch out for Spot! All well worn retainers get a little funky, so don't get worried. Dr. Thornton expects to see some grit and grime when he checks retainers, but we do want to help you keep things as fresh as possible. Retainers that are not cleaned properly will harbor extra bacteria and can contribute to bad breath, and no one wants that! A separate tooth brush, room temperature water and mild dish soap is the best option for daily cleaning. 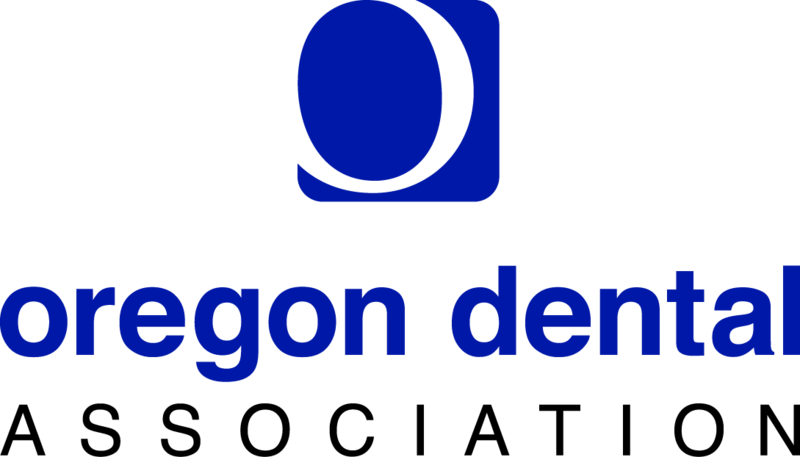 A deep clean can be accomplished with retainer or denture cleaning tablets purchased from the store. It is important NOT to wash your retainer in the dishwasher, microwave or boiling water, as these techniques will likely damage the appliance. Dr. Thornton always encourages all patients to continue wearing retainers nightly through out life, just to stay in the habit of regular wear. Even if patients choose to cut back on wearing their retainers, it is still very important to follow all the care details closely. With great retainer use, beautiful and healthy smiles will last a lifetime!